← Where in the Heck is it? This entry was posted in Railroad, Santa Cruz, Where in the Heck is it? 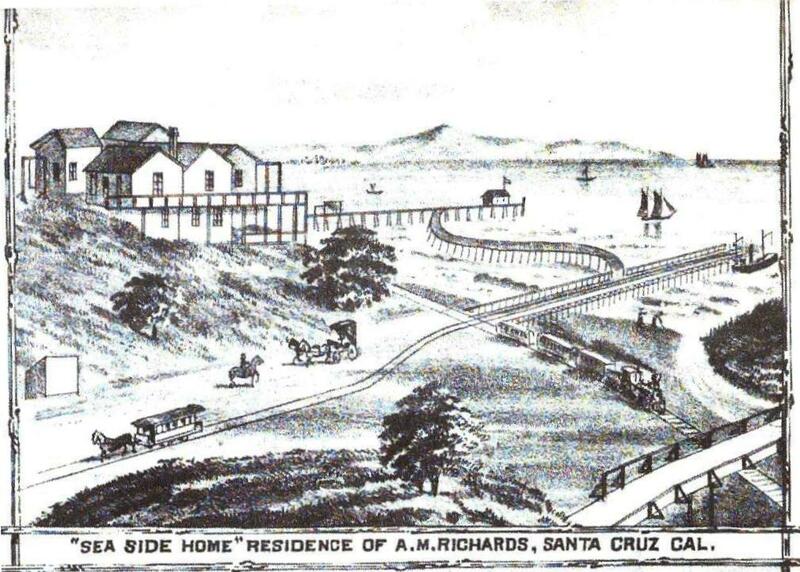 and tagged home of A. M. Richards, Railroad, santa cruz 1879, Where in the Heck is it?. Bookmark the permalink. I know exactly where this is. No, not up by Woodrow, but down in the area known as Cowell’s Beach today. There have been several piers in that part of the bay over the years. Furthest west was the pier that extended from what is known today as Bay Street, that pier was known as the Potato Chute (1849-1907). Next came the two piers in this drawing, the closest starting very close to the current wharf (built in 1914) was the Railroad Wharf (1856-1882) and the second was the Steamship Wharf (1877-1882). The two were connected as shown in this drawing, I believe to allow RR cars to load to and from the steamships. The final pier is not seen in this drawing, but is further east a few hundred yard; called The Pleasure Pier (1904-1963), it was for foot traffic only and often used by tourists visiting the Natatorium & Casino, the predecessors to today’s Beach Boardwalk.